You know the drill. If you link up, please take the time to visit some other people - this is a great way to make some new friends! My one and only confession: I've spent the past few days away from the computer - spending as much time as possible with my husband and friends. Because of that, I haven't had time to blog or visit blogs. 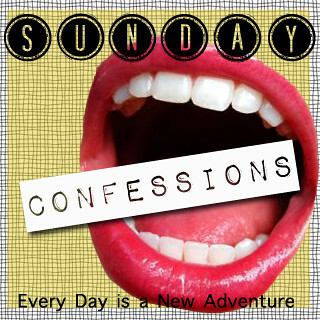 Instead of spending my Sunday "confessing," I'm going to spend time catching up on emails and visiting your blogs (and reading last week's confessions, since I haven't gotten around to that, either)! Love you guys, have a happy sunday!!! I confess that I gave a squeak of joy when I realized I was first to comment! I'm hardly ever first to comment. And you SHOULD be spending time with those people. It's lovely to be a blogger and use the net, but sometimes the people around us are WAY more important than the people here! I hope you have a peaceful, relaxing day of catching up! Yay for spending lots of time with your husband and friends! Enjoy! Taking some time away from the computer is one of the best decisions one can ever make! Your true and loyal readers will stay even if you don't blog for weeks because we love hearing from you! So spend as much time with your husband and friends before Baby G arrives because I'm sure we're in for a special treat and won't have near as much free time. Glad you've been enjoying yourself Alyx, don't ever let blog guilt get in the way!